More 5,000 music and art schools in Russia teach children to learn to play different instruments and master the basics of painting or sculpture practically free of charge, in addition to their regular education. The standard program in a music school includes lessons on how to play a musical instrument, as well as instruction on musical intervals and notation (solfeggio) and the history of music. Lessons are held in the second half of the day so as not to interfere with studies in regular school. As a rule, children attend lessons at music school 4-5 times a week. Children are enrolled in a music school based on the results of entrance exams that check their musical ability. The number of applicants depends greatly on the size of the population of the region where the school is located. On average, music education begins at about 6-8 years of age and is more often than not the parents’ choice rather than that of the child. For this reason, it is not uncommon for many people who studied at music school to remember that period of their life with hostility. Irina, a middle school teacher, studied flute in music school. “I chose that instrument so I didn’t have to carry a heavy guitar or cello around and because the course lasted five years, not seven like the piano class. I don’t play anymore, but I am able to help my daughter with her music school classes; she plays the piano,” she says. Tatyana Genova, a lecturer in the department of music theory at the Ippolitov-Ivanov State Institute of Music Pedagogy, mentions in a conversation with RIR that about 80 percent of her students came from music schools. However, the lecturer points out that almost everyone who has studied in a music school becomes someone who appreciates quality music. “In this way, thanks to music schools, the general level of culture in society is raised,” says Genova. Children cannot enter art school until they reach the age of 10. The educational program includes such subjects as drawing, painting, composition, sculpture, and the history of art. Lessons are held four times a week as a supplement to the regular school program. Irina Koshelyava, the director of Lipetsk Children’s Art School No. 2, is certain that art education in Russia is unique. “There is no similar system anywhere else. There are private studios and art therapy, but not art schools. But we have this system developed for children from 10 to 17 years of age. A graduate can later enter an art institute of higher education. In Russia this system of education has existed since as early as the 18th century,” she says. There are currently 5,328 children’s art schools, serving 12.1 percent of the country’s total child population. Music and art schools are both referred to as art schools. A children’s music school is an educational establishment in which children receive musical education and skills in addition to the academic education of their normal school. Such schools are the first stage of a musical education. There are also special 10-year musical schools at conservatories. They combine general educational programs and musical subjects in their curricula and prepare their students for entrance to the conservatory. 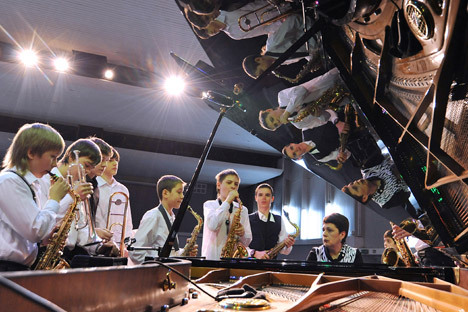 Currently, there are approximately 3,000 children’s’ music schools in Russia. Lessons in drawing, painting, composition, sculpture, art history, decorative and applied arts, and many other subjects are offered at children’s art schools. The standard term of instruction is 4-5 years. According to the statistics, the number of music and art schools has dropped noticeably in recent years; in 1990 there were 6,591, in 2001 – 5,837, and in 2008 – 5,456.